When will be Hollywood Movie Night with Karlie Kloss next episode air date? Is Hollywood Movie Night with Karlie Kloss renewed or cancelled? Where to countdown Hollywood Movie Night with Karlie Kloss air dates? Is Hollywood Movie Night with Karlie Kloss worth watching? Hollywood Movie Night with Karlie Kloss will be hosted by Victoria Secrets Supermodel Karlie Kloss and some of her supermodel friends offering moment-by-moment commentary around their favorite movies. Supermodel Karlie Kloss sits down with friends Ruby Rose and Kaia Gerber to watch "Disney•Pixar's Finding Nemo." While enjoying this animated favorite, Karlie and her friends play games, make Karlie's Kookies, and discuss why it's so cool to be different. Karlie and her guests, Ashley Graham, Lilly Singh and Kendall Jenner, watch the classic romantic comedy "Never Been Kissed," while discussing flashback fashion, first kisses, high school days and bullying. Hollywood Movie Night with Karlie Kloss next episode air date provides TVMaze for you. 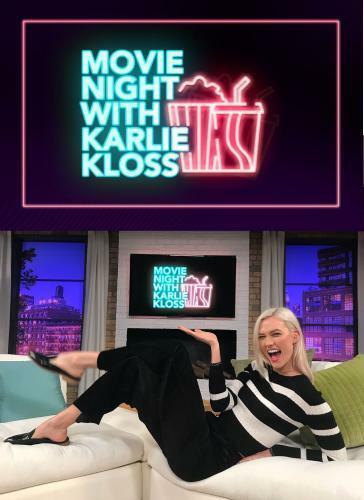 EpisoDate.com is your TV show guide to Countdown Hollywood Movie Night with Karlie Kloss Episode Air Dates and to stay in touch with Hollywood Movie Night with Karlie Kloss next episode Air Date and your others favorite TV Shows. Add the shows you like to a "Watchlist" and let the site take it from there.